Care for chickens is like most things; the more practice we get, the easier it is. Any time we set out to do something new there are mysteries involved. We will take you through the basics which will help you get started and turn that mystery into a thing of the past. and allows 4 square feet of floor space per chicken. The coop must keep night time predators out and chickens safely inside to properly care for chickens. Some people install automatic door controls, but short of that you will have to lock the chickens up at night and let them out in the morning. Have a yard attached to the coop that provides sunshine, protection from predators, shade for summer, some shelter from wind, rain or snow, and about 10 square feet per chicken or more. 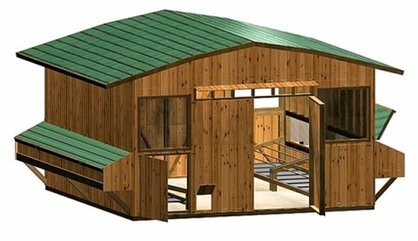 If you're like many folks you might be thinking about building your own coop...but are unsure which coop plans will help you most effectively. I know many folks are online bragging about their "best" plans and it gets confusing. So I took the time to preview a couple coop plan resources. Now that you have a place for them, you’ll need a few more things: Feed and a sturdy feeder, a container for water, calcium supplement like oyster shell grit or similar product and a feeder/container for it. If you’re at this stage, you’ve done well and there is just one more thing you need: Chickens! Care for chickens might be different, depending on why you have the chickens. Some chicken breeds are for egg production and some can be simply ornamental pets. Chickens that lay a lot of eggs through the year need layer feed. If you are raising a more ornamental chicken and breeding, they need breeder feed. If you want to show chickens they will need conditioning feed. If you plan to raise chickens for meat there are special grower feeds. So, before you get any chickens make sure you know why you want them and choose a breed that will work best. Chickens come in different sizes. Good care for chickens must include enough room inside and out for all the chickens you want to keep. If you don’t have a lot of room, you might select a Bantam breed, the smallest size. Most chickens are considered standard sized or large, which includes layer breeds. If you really have a lot of room, you might find a giant breed that you like, though these are less common. No matter the purpose, chickens benefit from a more natural diet than what’s in a feed sack. Chickens love to peck through grasses and soil looking for seeds, bugs, roots, worms and tender greens. The most important of these would be fresh greens. Some people, unable to allow chickens to free range in the yard, provide grass clippings (with no chemicals) or purchase fresh green lettuces and leafy vegetables to feed their chickens, in addition to dry feed. If you care for chickens, you must include greens in their diet. Another important issue is water. I’ve seen many a chicken waterer with filth in it causing the water to smell bad. This is a condition that is easily avoided and should never be. A bad smell comes from bacteria in the water and could make chickens sick. Water containers should be scrubbed frequently and water changed as often as necessary. Raising waterers off the ground near the level of the chicken’s backs will help keep junk from getting kicked into the water. I’ve met very few animals overly concerned about keeping their water clean, so we must be. Another option in care for chickens would be to provide electricity to the chicken coop. The advantages of this might be providing a heat lamp, necessary if you are raising chicks, or to warm adult chickens in the cold of winter. Healthy adult chickens generally don’t need electric heat if the coop is draft free, but heat will make their winter nights much more comfortable and can prevent chicken combs from getting frost bite. Some layer breeds stop laying in winter due to shortened day light hours, so providing 3 – 5 hours of full spectrum light before the sun comes up may give you eggs all winter. One thing I’ve noticed as I care for chickens is that they appreciate routines and predictability. They like being familiar with their surroundings and they appreciate knowing what to expect from one day to the next. Routines seem to help them stay calm and have a peaceful life, but there is one surprise they appreciate and that’s treats. You might offer them a loaf of good whole grain bread, or a bushel of apples, or bring them a nice warm pot of their dry feed soaked and steamy on a cold morning. There are few foods that chickens don’t like and some you should avoid. Avoid feeding chickens: sugar, salt, spoiled or moldy foods, caffeine, chocolate, and of course prevent them getting into any rat or mouse poisons, or chemicals not designed or properly used to treat chickens.